Here is how you can get HTTPS! These days one of the first things that a visitor will check is whether the website is secure or not. The lock next to the URL will give a clear idea about the same. 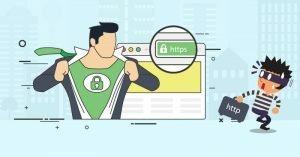 The important thing that one need to understand here is what is this HTTPS, its importance and how to get it for your website. HTTPS is an encrypted version of HTTP and it stands for Hyper Text Transfer Protocol Secure. Now the only HTTP is alright for a website that wants to display only the name and address and services of the company. But in the case of e-commerce website where the customer is going to make transactions, it is important that the website is secure. One very important thing that you need to understand here is that credit card information is not the only information that can be hacked. The hackers can also hack details like email addresses, passwords etc. So if the website is asking for any personal information of the customer then it needs to have the additional security layer. As already mentioned it gives an additional layer of security. The data will be transferred to the destination is a secure manner. The e-commerce websites were serious about HTTPS but the other websites did not bother much about HTTPS. But Google wanted a number of websites to opt for this security option. Therefore, now Google has made HTTPS an important parameter for SEO. That is those websites that have HTTPS will get better ranking as compared to those websites that do not have HTTPS. Also when the user sees the HTTPS they will have more confidence on the website. In fact, some browsers label the websites without the security layer as not secure and mark them in red. Websites with HTTPS have more speed in the modern web browsers. Since only 1% of the websites have the security layer it also gives a competitive advantage. In order to get HTTPS, you have to buy the SSL certification where SSL stands for Secure Socket Layer. In HTTPS the “S” comes from SSL. There are some hosting companies that will help you get the SSL certificate. Some domain companies also have packages that give SSL certificate along with the domain name. There are companies that will only sell SSL certificate. You will also come across companies that will give the SSL certificate for free. But these free SSL certificates do not give complete protection. They will not protect the user data adequately. The most important thing that you need to keep in mind is that you must always get the SSL certification from a trusted source. There are many fraudulent companies who can dupe you so you need to be careful. If you want better rankings in the search engines then HTTPS is an important parameter. It also gives the visitor the confidence that this is a secure website and that the data is secure.